Work "sitting" or "standing". Height can be adjusted for taller users (up to 6 1/4" above desktop) and the range of motion below desk is 5" for custom knee clearance. A simple one-handed motion instantly repositions keyboards height without locks or levers. 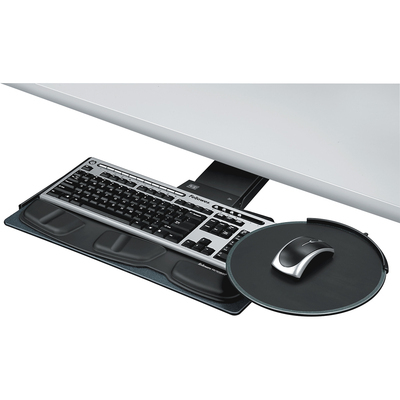 The 10" round mousing platform mounts over your keypad or flush with keyboard. Leatherette keyboard palm support with Microban® antimicrobial product protection keeps product cleaner.